I know, let's take one of the most harmful gasses on Earth and transform it into useful stuff like biofuel or even plastics? Sounds easier said than done, but one group of researchers has accomplished the impossible -- using science that essentially copycats Mother Nature herself. Scientists from the U.S. Department of Energy and the University of California, Berkeley, could have just solved climate change -- what many believe is one of the worst threats to the future of humanity. 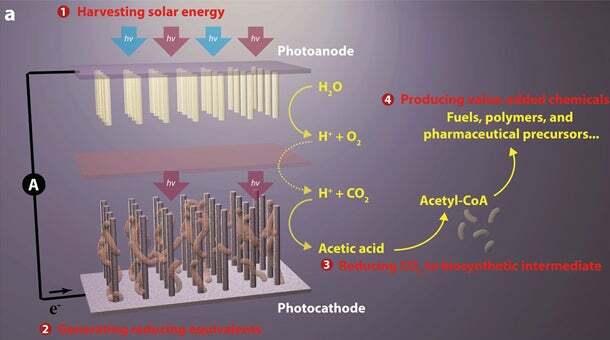 The researchers created an artificial photosynthesis prototype system. Sounds like a mouthful, right? Essentially, the system uses solar energy to trap carbon dioxide and synthesize it into acetate, a basic building block for organic compounds. The acetate could then be used to create cleaner, greener versions of things, like pharmaceuticals, plastics and, most importantly, renewable biofuels. In case you're a little dusty on your 9th-grade biology, photosynthesis is the chemical process by which plants convert carbon dioxide, water and light into pure, clean oxygen -- the very stuff we need to stay alive. The lab-made version of photosynthesis would lead to clean fuel and hopefully lots more of it. The process involves a system that integrates carbon dioxide-eating E.coli bacteria and sunlight-catching semi-conducting nanowires. It might not sound like the stuff of a big-time breakthrough, but scientists at Berkeley think the system could be the first major step toward the global warming solution many are looking for. If they're right, and if they can replicate the system on a larger scale, the carbon in our atmosphere could be harnessed and transformed into renewable gas. Buh-bye, fossil fuel dependence and greenhouse gas pollution. How awesome would that be? "Our system has the potential to fundamentally change the chemical and oil industry in that we can produce chemicals and fuels in a totally renewable way," said lead chemist on the project Peidong Yang, "rather than extracting them from deep below the ground." Yang also called the whole thing one, big "crazy idea." Crazy or not, it sounds pretty brilliant.